What is the True Cost of Owning a Car? Gas, insurance, maintenance, and loan interest can really add up. What costs go into owning a car? From paying for routine maintenance to keeping up-to-date insurance and endlessly filling up the gas tank, car ownership costs can add up quickly. Knowing what to expect can save you from getting in over your head. The last thing you want to deal with is an upside down car loan... or, worse, the repo man. How Much Does the Car Itself Cost? In January 2018, the industry-wide average cost of a brand-new car totaled $36,270, according to Kelley Blue Book. That’s a lot of money! Of course, the average consumer isn’t buying a new car every time they flip a page on the calendar, so the cost of the car is amortized over the length of time you own the car. The average length of time drivers keep a new vehicle, according to research by R.L. Polk, is 71.4 months, or about six years. At that rate, if you buy your car with no financing, you’re looking at an average cost of $508 a month. But most people don’t buy a car without taking out a loan. If you have excellent credit (720+) and apply for a 60-month loan, you’re looking at an average annual interest rate of around 2.87%. If you don’t put down a downpayment, you’re looking at paying an extra $2,707 more over the lifetime of your car. Again assuming you keep your car for the average amount of time, you’re looking at paying that amount spread over 60 months, and then paying nothing for the last 11.4 months of ownership, working out to an average of $37.91 extra per month. If, on the other hand, you only have fair credit (620-659), you can expect an interest rate of around 13.58% per year. 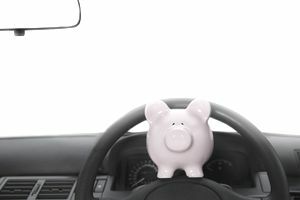 It would bring your total costs up to $13,894 in interest over 60 months, or an average of $194.59 per month, and $2,335 per year, for the lifetime of your vehicle. Of all the factors on this list, car insurance costs are among the hardest things to determine without more information. Everything from your credit score, age, and marital status, to the city in which you live and how often you drive your vehicle, will impact how much you will pay. Your best bet is searching the internet for “free car insurance quotes” and comparing rates, as well as speaking to friends and families about companies they recommend. But for convenience's sake, let’s imagine that you, your city, your vehicle and your driving habits are perfectly average in every way. According to a study commissioned by Quadrant Information Services, the average annual cost of car insurance in America is just over $1,300, which works out to $108.33 per month. If you are in a car accident, you will be responsible for the deductible in order to get your vehicle repaired. If you do not have the proper coverage for the accident at hand, you will be responsible for the full amount. Don't forget about traffic violations and the costs that come along with them. Higher insurance rates and fines are both to be expected if you receive a ticket. Gas prices are also highly variable, and can change from day to day -- or from one side of the highway to the other! It’s impossible to accurately predict exactly how much gas prices will fluctuate, but in the past five years, the U.S. average price for gas has varied between $1.69 and $3.70 per gallon. Assuming that an “average year” is somewhere in between, let's assume you can expect to pay around $2.00 per gallon of gas. Of course, even more, important than the price of gas is the gas mileage of your particular vehicle and how much you drive in a given month. In 2016, the average gas mileage of new cars and light trucks sold in the United States was 24.7 miles per gallon. The average American, the Federal Highway Administration reports, travels about 13,476 miles per year. But the most significant two determinants of how far you will drive are your age and your gender, so it’s worth checking out their chart. Assuming you are (once again) average in every way, you can find out your annual gas costs by dividing the miles driven per year by the miles per gallon your vehicle gets, then multiplying that number by the price per gallon. In this “average” case, the math is (13,476 / 24.7) • $2.00 = $1,091.17 per year. Car maintenance costs can also vary quite a bit, and total up to several thousand dollars per year. If you have a new car that is from a reputable company, you can expect to pay less than $1,000 per year, on average. As you can see, all of these costs add up! When you include the price of ownership, the price of your loan, the costs of insurance, costs of maintenance, and costs of gas, you are looking at spending around $9,000 to $11,000 per year to own a car -- bringing the total costs to almost $53,550 over the 6 years of car ownership. Driving gets expensive leaving many opting out out car ownership. Taking public transit and using rideshare services like Uber or Lyft can be a huge cost saving. Consider all of your options and the full scope of the situation before going all in on buying a car.